Whether you're fishing in Cabo San Lucas, a pier in your backyard, or the multitude of lakes, ponds, rivers and beaches throughout the World of Warcraft, you're going to need a bit of knowledge, some fishing skill, and a fishing pole. To get started with fishing as a secondary profession in WoW, you'll need to visit one of the many Fishing Trainers lurking about the cities (and popular fishing holes) and pay them to teach you basic fishing skill. Only level five (5) toons (and up) can learn to fish. To advance beyond fishing skill of 75, your toons must be level ten (10) or higher. As you become a better angler, you will want to upgrade your fishing equipment to gain an edge over the tougher sport fish you aim to catch. In addition to bonuses from fishing poles, you can increase the fishing bonus with certain equipment (ie: hats, boots, & item ehchantments for gloves), lures, drinks, and fishing lines that can be added to the poles. When you go fishing in Northrend, you will need a fishing skill above 500 to stop catching junk. 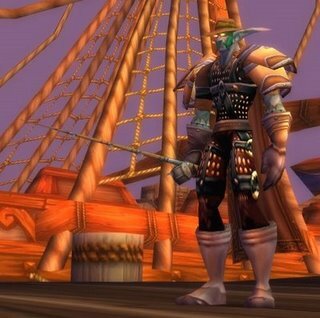 In this article, I only discuss wow fishing poles. 3) get rezzed at the graveyard and suffer a durability penalty on all your gear. where you can acquire these magnificent treasures. *Read Plenti-O-Fish's Fishing Expedition Story at Trader Wow's Blog: Plenti's Expedition. Ole Plenti caught his Darkwood Fishing Pole while camping at Duskwood's Hushed Bank. From Sentinel Hill, in Westfall: Take the main road to Duskwood. The bridge to Duskwood crosses the Hushed Bank. 1) Fishing Pole: You can purchase this beauty from any "Fishing Supplies" vendor and most "Trade Supplies" vendors. Sometimes you can even find them for sale in the Auction House. You'll need to be at least level five (5) to learn fishing and equip this masterpiece of angling hardware. 2) Blump Family Fishing Pole: This little darlin' is a quest reward from Gubber Blump in Auberdine for catching 6 Darkshore Groupers. Auberdine, located in Darkshore on the continent of Kalimdor, is the nearest port to Darnassas. 3) Strong Fishing Pole: This sweet gem is an excellent gift for any angler in the family. It can be purchased from many fishing supply vendors and is usually listed in the Auction House as well. Every one of my fishing toons has one of these fishing rods. They never break and seldom tangle up the ole' fishing line. They're even good for poking nasty critters in the eye without the need to to get out of yer fishin' chair. 4) Darkwood Fishing Pole: This slippery rod and reel has gotten away from many anglers in Kalimdor and the Eastern Kingdoms while reeling in tough fighting fish. Occasionally, you can fish one of these rods right out of the water and put it back into service after a good cleaning. It will boost your fishing skill by a full fifteen (15) points. I have yet to catch one of these lovely fishing poles, but certainly not for lack of trying. However, my Orcish pal, Plenti-O-Fish, caught his Darkwood Fishing Pole in Duskwood while fishing along the Hushed Bank (just across the river from Westfall). 5) Big Iron Fishing Pole: This crafty fish snagger can only be found in shelfish traps off the coast of southern Desolace. Only level twenty-five (25) toons with fishing skill of a hundred (100) or higher can equip this handy fishing rod. 6) Nat Pagle's Extreem Angler FC-5000: This surf casting gear is easily acquired in the Hinterlands from a quest provided by "Katoom the Angler" at Revantusk Village. Just skewer 15 Saltwater Snapjaw turtles and Katoom with hand over one of Nat Pagle's finest reels. 7) Seth's Graphite Fishing Pole: I'm sure Seth, in Shattrath, would rather be fishin', but he's kind enough to hand out his Graphite fishing pole to anyone who completes his quest by bringin' him eight (8) Pristine Shimmerscale Eel's. Seth's graphite design produces a real whipper-snapper of a fishing pole that doubles as a great self defense weapon. It also grants +52 stamina which come's in handy when reeling in the catch of the day. 8) Nat's Lucky Fishing Pole: Ole' Nat Pagle makes one of the finest fishing poles in all of Azeroth. This ace-of-a-rod is only given to the bravest of anglers who complete Nat's "Angler Extreme" fishing quest. If you're "Army Strong", then head out to Nat's villa in Duskwallow Marsh and grab the quest that will send you across two continents in search of some extreme sporting fish. 9) Arcanite Fishing Pole: Nat Pagle is certainly the "Tiger Woods" of sport fishing in the World of Warcraft. He even endorses the Arcanite Fishing Pole awarded to the winner of the weekly Sunday Fishing Tournament in Stranglethorn Vale at Booty Bay. Be the first (1st) angler to catch and turn-in 40 Speckled Tasteyfish and you will be the proud owner of the most sought after piece of fishing gear in all of WoW. With a bonus of +40 to fishing skill, there is no fishing rod to match it's craftsmanship. 10) Jeweled Fishing Pole: There are a few (3) fishing poles in World of Warcraft and are reserved for the elite. This is one of them. The Jeweled Fishing Pole is a random reward for completing any of the daily fishing quests ("dailies") in Dalaran. It's contained in the "Bag of Fishing Treasure" which you receive as a reward for completing the Fishing Dailies. This bag contains any one of 39 random items, but some of those items include: Weather-Beaten Fishing Hat, High Test Eternium Fishing Line, Recipe: Captain Rumsey's Lager, and Bone Fishing Pole. 11) Bone Fishing Pole: Similar to the Jeweled Fishing Pole, this treasure is also a random reward for completing any of the Fishing Dailies in Dalaran and mostly for the "elite" crowd. 12) Mastercraft Kalu'ak Fishing Pole: This extraordinary piece of fishing gear is created by hand for the Kalu'ak elite. The Mastercraft Kalu'ak fishing pole also enables breathing under water. This is a very handy feature if you're scuba diving off the great barrier reef or adventuring in the under water realms of WoW. Your reputation with the Kalu'ak must be exalted if you want to aquire this magnificent fishing pole. Dont forget to bring your gold purse, either. This baby will set you back 128 gold pieces and change when you buy it from Sairuk or Tanaika in Northrend.